This has to be the coolest mushroom I’ve ever personally encountered (and that includes the one that will colonize peoples’ nasal cavities). I went down the road to the 100-acre woods this afternoon, bundling myself up snugly and pulling out my long johns and winter coat for the first time. I also got to try out a new toque Dan’s mom brought home for me from Scotland, one that extends down the sides of the face in cozy ear flaps. It’s my new favourite toque. Despite the brisk 5 C (41 F) temperature (which will feel balmy in a few months), I was nice and comfortable for the walk. This was important, because if I hadn’t’ve been, I would’ve decided to skip the last loop of the trail. Since I was comfortable, my ears weren’t frozen and my thighs weren’t numb, I figured we might as well hike ’round it and enjoy the last section of forest. And if I hadn’t done that, then I would’ve missed this awesome mushroom. This is a Netted Stinkhorn, Dictyophora duplicata. Also known as the Skirted Stinkhorn (the name it goes by in the Lone Pine mushroom guide I have) or Veiled Stinkhorn, it takes its name from that lacy fringe that hangs down from the cap. This one happens to be a very modest fringe; in some it can flare out from the stalk like an A-line skirt on a dancer doing pirouettes. Incidentally, that’s a very inappropriately pretty image for this mushroom. 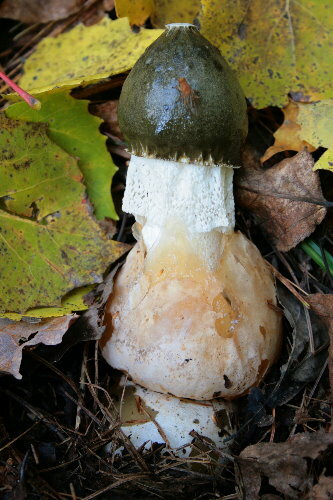 It is also sometimes placed in the genus Phallus, a genus of stinkhorns named for their suggestive shape. And it takes the other half of its common name from – you guessed it – its smell. If you can read French, then you already know what it smells like from the title of this post: rotten meat. The individuals I came across today were only just getting started, but a stinkhorn in full stink is detectable from a considerable distance away. It’s so strong that this website recounts a meeting of the North American Mycological Association where a specimen of a stinkhorn had to be isolated outside, even though all the other fungi were on tables indoors. The mushroom uses the smell to attract insects that come to carrion, primarily flies. When the flies arrive, they’re drawn to the sticky cap, which is covered in a gooey, sweet (apparently) layer that the insects can feed on. Embedded in this goo are the mushroom’s spores. When the insects land and walk across it, some of the goo and spores get stuck on the insect’s legs or body and carried off. Eventually the insect will probably land and deposit the spores somewhere appropriate for the fungus to grow. 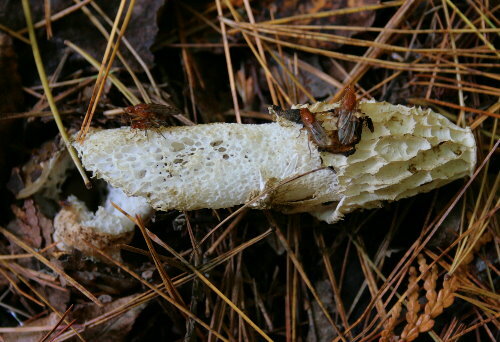 The stinkhorn is completely dependent on flies and other insects to transport its spores, since they can’t be carried on the wind as with most mushrooms. Netted Stinkhorns grow in rich soils in deciduous woodlands. Unlike most fungi, which have a root-like network called a mycelium from which the fruiting body itself sprouts, stinkhorns begin life as an egg. It starts out small (obviously, since the spores are microscopic) and gradually grows in size. When it breaks the surface of the soil it may resemble a small puffball. The difference is that inside a baby fungus is forming; if you slice a stinkhorn egg open, you’ll find a tubular formation that will eventually grow into the full mushroom. 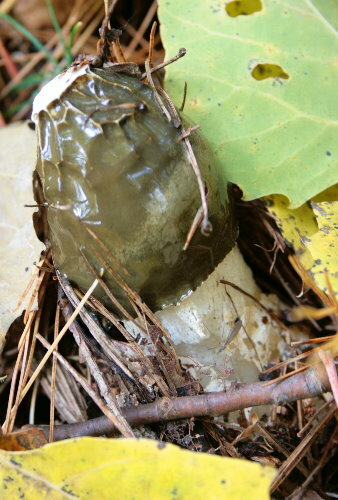 When it’s ready to emerge, the “skin” of the egg splits and a nearly full-grown stinkhorn cap emerges. 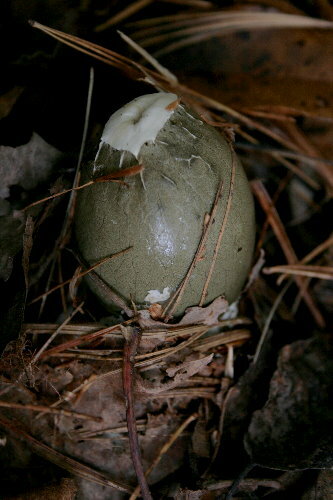 In the first photo, the egg is the peachy-coloured mass at the base. The stalk is rapidly grown underneath of the cap, pushing it out. The growth of a stinkhorn, from egg to full length, is incredibly fast – a matter of hours, you could almost set up a lawnchair to watch. To save you some time, though, check out this time-lapse video of four stinkhorns emerging and then dying. The full video is over the course of 77 hours (3 days 5 hours), with frames taken at 5 minute intervals. The whole video is 43 seconds. The first stinkhorn to emerge lasts only 24 of those seconds, and takes just 2 seconds to reach full length. Two seconds of video works out to about 3.5 hours. As the stinkhorn ages, its cap goes from a smooth sphere to slightly wrinkled (see second photo) to very wrinkled. By the time all the goo has been picked off the cap by insects (and what isn’t often liquefies and runs or is washed off), all that’s left is a thin network of white creases. Eventually the skirt deteriorates and the stalk may break and fall over. This was an older one that I actually found last week when I was hiking through there. At the time it was the only one I saw. It had disappeared by today, but three others had grown to take its place. It was a warmer day last week, which probably accounts for the greater number of flies on the dead one than the fresh ones – although, I did notice that it was considerably smellier than any of the three today were. This species of fly seemed to be the most abundant visitor at the stinkhorns. No, don’t ask me to identify what it is. Someday I’ll learn to at least ID them to family, but I’m not there yet. 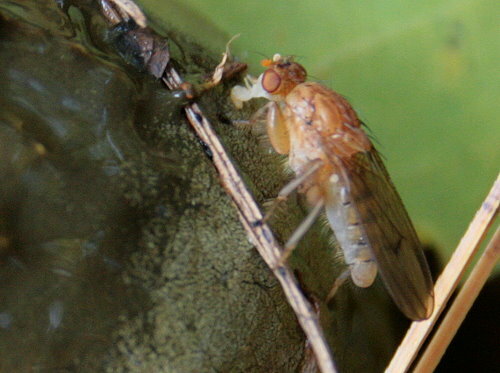 A few websites suggested that blow flies such as Bluebottles are among the most common visitors. Given the albinistic look of this one, though, I might hazard a guess that it was a Suillia sp., a group whose larvae grow “in carrion, dung, or rotting fungi”, according to the Kaufman guide to insects. Although the smell would probably put anyone off wanting to try the mature mushroom, apparently the eggs are edible and reasonably tasty. That said, in cultures where such things are often practiced, the mature mushroom, sans cap, is sometimes eaten as an aphrodisiac (which makes sense if you subscribe to the believe that items from nature will cure ailments of those organs which they resemble). I decided not to try any. well it just looks like i have on my custom t-shirts of manila trip. That’s a funny anecdote! You may be interested to know – some mycological trivia – that it was an old joke to put one of these stink-horn eggs into the room of a newly married couple on their wedding night, both for the suggestive nature of its shape and also the smell. I burst into uproarious laughter seeing that first image and reading “This has to be the coolest mushroom I’ve ever personally encountered…” It took me several minutes to calm down enough so I could continue with the rest of this post. These are cool mushrooms, though I’ve been around when their kind offer up their perfume. I won’t be using these for a centerpiece. And that fly photo is an excellent capture.